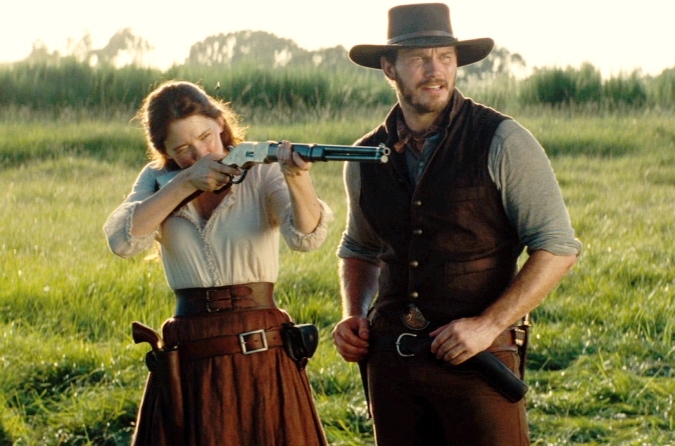 "Seven gunslingers join forces in order to protect a small town from a mining tycoon (Peter Sarsgaard) and his goons, who plan to seize the residents' land by force. 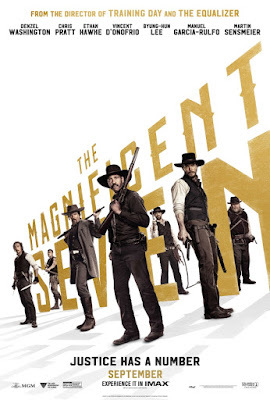 The seven-man army is led by a mysterious bounty hunter (Denzel Washington), and also includes a sharp-witted gambler (Chris Pratt), a troubled ex-Civil War soldier (Ethan Hawke), a mountain man (Vincent D'Onofrio), an expert knife thrower (Byung-hun Lee), an outlaw (Manuel Garcia-Rulfo), and a Comanche warrior (Martin Sensmeier). " The Magnificent Seven which is a remake of the 1960's film of the same name based off of the Japanese film, Seven Samurai (1954) is a good action film that will entertain you but not Oscar worthy by a long shot. A star studded cast led by Denzel Washington and Chris Pratt, they play gunslingers joined by five others all with their own quirks and skills to defeat a mining tycoon threatening a small town. Unfortunately with such a large cast, and a big focus on action scenes which isn't a bad thing, character development and bonding of characters are minimized. 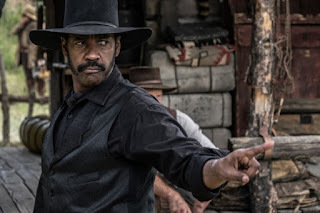 Denzel is great as the badass bounty hunter Sam Chisolm. Chris Pratt is predictable as the humorous John Farraday. Ethan Hawke and Haley Bennett are the performance stealers for me. Vincent D'Onofrio who plays Kingpin on Netflix's Daredevil is unrecognizable as Jack Horne showing his depth as an actor as well the great make up artists and costumer designers for the film. Peter Sarsgaard as the villain Bartholomew Bogue would be my only negative, who does everything a great villain should do (killing helpless innocent people) but his mannerism and delivery of lines is just unconvincing to me and a bit cartoonish. Overall, I would recommend the film especially if you enjoy westerns or if you like action films with shootouts. The film is a bit predictable in its plot, for example with the two Indians toward the end. But the pacing is good for an action film, and the performances overall while not amazing is good enough given the straight forward shoot from the hip story line and dialogue the actors and actresses are given. We were super excited when we were selected to review the Zoomer Chimp by Spin Master through BzzAgent. I first came across the toy at Toy Fair 2016 and was super impress by the amount of features it offers. I was only briefly familiar with the "Zoomer" line, with the Chimp its most technologically advance and lifelike one to date. The others previously offered by Spin Master being the Kitty, Dog and Dino. Zoomer Chimp which is indicated as for ages 5+ runs on rechargeable batteries which you can plug with a USB cable to a PC to charge or if you have a USB outlet on the wall. Upon first showing it to my ten old daughter her initial reaction was “those are some creepy black eyes!” But once I had it unpacked and charged she was more than excited to try it out as well when I started monkeying around with it. The amount of articulation and facial expressions that can become animated is a dream of every kid that has ever own a GI Joe and Transformers toy that wished their figures would come alive before them. This generation of kids with the Zoomer line are truly blessed thanks to Spin Master. The Zoomer Chimp offers numerous modes including “tricks” and “voice command” which the latter was my favorite. There are also “Guard mode” and others which is indicated by the color of the light up eyes of the Chimp. Initially, I found the learning curve a bit steep despite a small booklet of instructions and even a link to an instructional YouTube video. But it really takes a hands on playing around with the little Chimp to get to know it and even then it can be a bit unpredictable. It is advertised as knowing over 100+ tricks! I like to think of it as a little playful kid with attitude! Overall, I would highly recommend the toy for this holiday season. While I did not have a chance to play with it extensively, the Zoomer Chimp appeared well made and capable to provide hours of entertainment to justify the $119.99 retail price. I love how the instructions are written in a way that is friendly to children reminding us constantly not to play the Chimp on tabletops. I love the realism of the facial movements as well as the body movements. This is Rise of the Planet of the Apes meet Terminator in a Rated G entertainingly playful sort of way. Kids under 5 will be frightened by the animated Chimp as my 1 ½ year old was, so the age recommendation is pretty right on target. We are excited to be giving away to one reader a DVD copy of The Swan Princess: Princess Tomorrow, Pirate Today! The Swan Princess: Princess Tomorrow, Pirate Today is out on DVD September 6 from Sony Home Entertainment! In the brand new original animated film, Princess Alise is training to be the perfect royal but in her heart all she wants to do is sail the seven seas as a swashbuckling pirate! After setting sail, Princess Alise is shipwrecked and washes ashore on an island where she meets Lucas, a young boy who has been living there by herself. They have to work together to survive and get back to civilization! Buy The Swan Princess: Princess Tomorrow, PIrate Today! Follow The Swan Princess: Princess Tomorrow, Pirate Today! 3. Take the “Are You A Princess Or A Pirate Quiz” and post their results in the comment section below including your full name and Twitter handle. Contest ends 9/24/2016 Midnight ET. Open to US and Canadian residents only. Each household is only eligible to win The Swan Princess: Princess Tomorrow, Pirate Today! DVD via blog reviews and giveaways. Only one entrant per mailing address per giveaway. If you have won the same prize on another blog, you will not be eligible to win it again. Winner is subject to eligibility verification. Good luck!